I have a mantra here that the only ride I regret is the one I didn&apos;t take… even on those days where I just don&apos;t feel it… once out there on the horse something wonderful comes of it. Right? So finally a ride where I almost take it back. It began in the field. The mares were half way down the multi-acre pasture and when I came into the field they gradually migrated all the way to the farthest corner. Though so often my beloved steed greets me at the gate with nickers and drops her head into the halter- something about late summer changes up their routine each year to hanging around at the far end until evening. I think it&apos;s the shady tree line. She wasn&apos;t hard to catch- didn&apos;t run away but she was NOT enthusiastic. Sorry to say- you need some exercise. Between the 26 mile ride last weekend and getting a somewhat invasive hoof trim early in the week- you&apos;ve had enough time off and we need to climb the mountain today…. get some miles. Whatever. She seemed to reply. ** one major thing I&apos;m sorting out after the barefoot class and some personal research is that horses in boots really need to be padded. On a giving surface, the entire sole should be able to help support bearing the massive weight of the horse. First the soft-tissue part of the heel makes contact which is what does the most impact softening, then the inner wall and laminae and outer parts of the sole as the movement follows through the frog getting contact with earth helping move the blood like an auxiliary pump back up the leg- and on a giving surface the hoof will sink in enough to momentarily distribute all the weight onto the full sole before finishing the movement on the hardest-bone structured toe that drives the power of the stride forward. When using hoof boots, the earth cannot meet the full sole and give that momentary full weight distribution which ends up acting a lot like a non-giving (hard) surface. In essence using hoof boots and no pads is a little like my horse walking on hard pack or pavement for those miles because it demands the hoof walls and laminae (and possibly the frog) to always bear all the weight. Hm. So I&apos;m experimenting with pads at the moment to see if I can use them without rubbing on the heels and if they&apos;ll stay put etc. Once booted, padded and saddled up, the walk out was a dilly-dally that I had to use every bit of mental energy to Jedi-power her forward and then occasionally a little tap from my crop when she thought we might be camping at a nice grass clump for the night. Add to that the terrible horse flies that we often just had to pause, wait to land, and slap slap slap until stunning or death. A couple miles up the mountain we both hear a lot of crashing noise and too near for my taste a young bear cub comes hot-tailing down a tree and scampers loudly off. Khaleesi is certain we should turn and run home – she spins around but I convince her to face forward and wait. She stands her ground and I&apos;m left wondering where mama is. After a few minutes we calmly walk on. This is Khaleesi&apos;s first bear that I&apos;m aware of. I&apos;d run into a fair amount of them in years past with Faygo but just haven&apos;t seen a bear on trail in about 3 years now. She did great. And don&apos;t get me wrong – I love to see bears! We make it up the mountain and begin to descend into Little Valley – yes, its steep, but that&apos;s why I like this route. Great training. Man alive she is going even slower than down this mountain than she did climbing up! Apparently the grass and road is a little slick. She decides to try the tiny swell on the off side of the wash-out bordering a decent incline to the wooded mountainside on our right, and as I&apos;m suggesting it doesn&apos;t seem like the best choice to me she slips right back down into the wash-out four legs down onto her side with me trying to decide if I should get off or hang tight. She is good enough to wait for my decision and I adjust myself better into the saddle and she gets up with me still in tow. I feel like I&apos;m riding an elephant today. I start to ask if she&apos;s ok when she sees a juicy grass patch and the change of focus into relaxed eating as if nothing had happened answers my question and I ask her to move along. Another couple of miles we go through a particularly overgrown section where the grasses are knee high and she begins to panic and kick and dance. I know exactly what&apos;s happening and attempt to kick her forward out of the worst of it. She keeps trying to put her head down to bite and itch her leg (just what will make it worse!) and I&apos;m popping her with my crop to MOVE JUST GO!! Go!!!!! It&apos;s what I call the Velcro peas and they were all over her legs, side, and now ears and head. They aren&apos;t painful but extremely annoying. She was being attacked by the plants. I got her to stop dancing enough to dismount and began removal which also meant they were getting all over me. This process took about 10 minutes between her and me and then I had to look ahead to see if I could avoid more of these hidden green monsters until we hit the next trail that would likely be free of it. Between that and sawing a log on my friend&apos;s property trail that was just close enough to their impossible to open gate it wasn&apos;t worth getting back on… I spent a decent amount of that section on foot. Finally in their yard with some huge mounting boulders (the balance saddle is awesome but it will slip if I mount from the ground- especially when K&apos;s sweaty) I got back on my horse and decided to have a good attitude and enjoy some calm relaxed walking through the quiet (practically ghost) town of Bolar. We ride the road through here- often actually- and most times don&apos;t see any vehicles. The speed limit is 25 – the road goes nowhere and is curvy so drivers are not usually in a hurry and not often going very fast. Khaleesi and I ducked into Bolar Run for a quick drink and upon popping back out onto the road- the wrong side of the road for the direction we were moving- I heard a vehicle. I stayed put because it was moving at a decent speed and I had a little extra grass at the side of the road to tuck into and the vehicle wouldn&apos;t see us until it made the turn – not very far, but far enough to slow down if I stayed where I was. It was the mail jeep and headed both too fast and also too close for my comfort. I tried the universal &apos;slow down&apos; arm wave but apparently he thought I was waving at him and waved back. I couldn&apos;t believe he would drive so fast so close to us- it almost felt like a game of chicken but we had no where to go- Khaleesi began to panic and spin looking for somewhere to run as I yelled (so he could hear me) SLOW DOWN! PLEASE CAN YOU SLOW DOWN!? He did finally and said he was sorry he didn&apos;t know &apos;the horse would do that&apos;. I thanked him and got K to settle as he drove on and looked back to see she&apos;d thrown a back boot in the spinning dance. Not surprising. At least I wasn&apos;t in metal shoes on the pavement. Then I realized that postman might have done me a huge favor because as I was on the ground picking up the discarded boot I heard it. A really really big rumbling. Far enough out for me to get us over to the other side of the road (where I belonged) and set myself up for what I knew was going to be much worse that the postal jeep. And to stay on the ground. When the massive dump truck came sailing around the corner I got his attention and he slowed right to a stop. It&apos;s the kind of truck that makes big scary noises even with it isn&apos;t moving. When it does move even slowly, the bed seems to jump around slamming metal and the engine is deafening. I motioned him to come on past and he did so slowly. Khaleesi was in considerate fear for her life and was looking everywhere for an exit but behind us was a rock wall so she just cowered behind me in this strange stance I think I&apos;ve seen my cat do once or twice with her front legs out in front of her and her back legs shaking underneath. I just kept my breath even because I knew the giant truck wasn&apos;t coming to get us. Khaleesi could spin and dance on my short lead as much as she needed but would not get away and it would pass. As long as I stayed calm we&apos;d be fine. The driver was doing his best to move past us nice and easy. As he passed she bobbed on my lead back and forth behind me until we were able to move on with the truck safely behind us. Boot in hand I wasn&apos;t even considering trying to put it on there on the road. We had less than a mile to the red gate back to private trails and I just needed to hand walk her and regain my own composure. We are generally fine with cars, trucks, even motorcycles. And this little stretch of road in the middle of nowhere is hardly traveled yet I just had two decently frightening vehicle experiences. Maybe the worst ones I&apos;ve had to deal with in my riding till now- all in a few minutes. Where is that flask when you need it?! I start walking looking around and realize I&apos;d just passed a decent dirt ledge- I only need a foot or two to make the difference and that could do it. So I turn around and ask K to follow. She says NO WAY JOSE. I move the reins over her head (my lead rope) and try to start maneuvering her so I can get on and she bites me!!!! I AM NOT GOING BACK THERE!! I had to laugh at this point. Bite is a little exaggerated but it technically was her teeth to my arm so I will call it that. But it was like she scraped my arm so gently I barely knew what had happened (so no bruise or pain) – it was a cry for help. Me: Ok – no – listen – we are not going back to the road, to Bolar, and over the mountain again. I do know this is the best way home- I just need to back up to this ledge to get on… work with me ok? She seemed to understand and cooperated to lining up for me to mount. Trust me- we both want to go home! Ok- only 4 more miles to go. What more could happen? Ok… now what is it girl? A large adult black bear crosses the trail a handful of yards in front of us. Seriously. It&apos;s a two bear kind of day I suppose. I again ask her to just wait. Let&apos;s see if anyone else is following before we move on. But you can relax. She does. A little. And someone else is following. A very large doe jumps across the trail at the very same spot. Just two snapping turtles getting it on. Yes. At least that&apos;s what I assume is going on when one is angled on top of the other. At this point they&apos;d both pulled into their shells… I think we were ruining their moment. Let&apos;s walk a bit and see how it goes. Easy like. Only 3 miles to go and I notice a cloud seems to be darkening the woods. I try to see the direction our weather comes in figuring the way my luck has been today we&apos;re about to be drenched in a full on thunderstorm. Funny – I don&apos;t hear any thunder… and there doesn&apos;t seem to be wind either. Oh. Right. This is eclipse day! This must be that time. So for a little while the ride from hell turned a little bit magical as I wondered what would happen… I knew we weren&apos;t in full eclipse zone, but how dark would it get… and how long I couldn&apos;t remember – just a few minutes I was pretty sure. It was neat to see the shadows on the ground and the pretty dim light mid-day. I didn&apos;t sense Khaleesi was concerned about it and we finally settled into a relaxed trot again after spooking one last deer right off the trail. At this point jumping a deer was barely enough for a twitch and though I caught my breath (it&apos;s a little startling) it is after all only a deer. 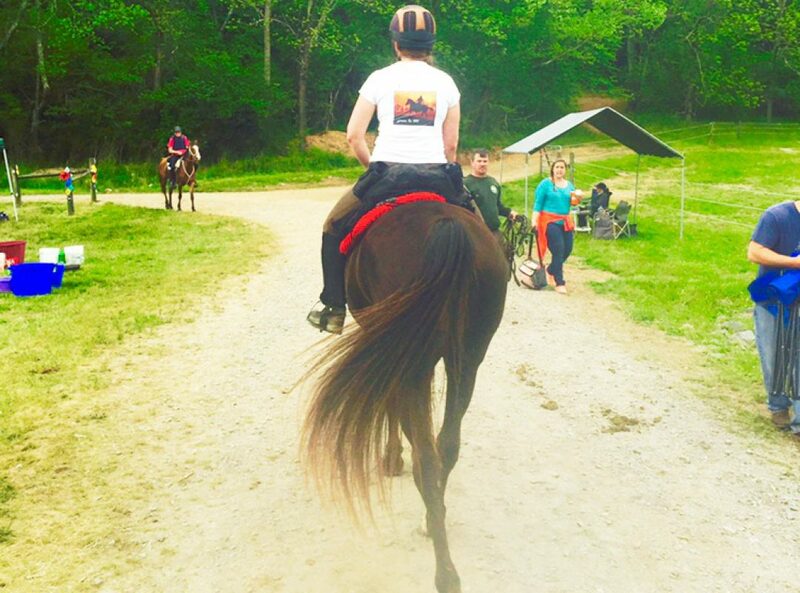 Finally arriving back at the barn the drama began to fade and the positives surfaces. We got in the climbing miles I wanted. We developed deeper trust getting through a few dicey moments together. I ended up riding in the woods during the eclipse even though I hadn&apos;t planned it. The saddle is great and there&apos;s not a hint of sensitivity in her back right now. Boots made the entire ride. Due to her back feet being even smaller after the trim I tried an old pair of Faygo&apos; renegades and they did well. I&apos;m still waiting on the Scoot Boot Narrows to release! Gave her a shower-rinse and put her in the field where she of course rolled in the grass and took a big drink. It may have been my least favorite ride and too dramatic for my taste, but it was still a ride. Next: Next post: What can I say?